You have to take risks for everything you choose to do. And the size of the risk depends on what you choose. For example, if you want to play tricks in private poker game, but you do not want to play a high risk, the transparent plastic baccarat Blackjack shoe for unprocessed playing cards is suitable for you. There is no scanning camera or monitor camera inside the blackjack shoe. 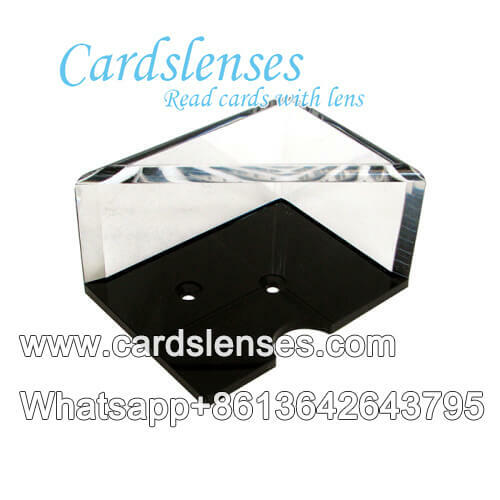 The reason why you can see the cards suit and point of playing cards is because of refraction principle. A little change has been made on the inside structure of this casino cards tricks blackjack shoe. A diamond shape mirror can let you see every playing cards when you licensing.